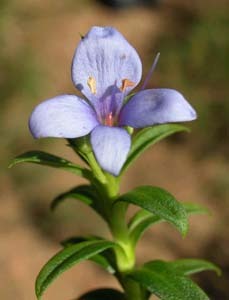 Veronica continua is a reasonably common native shrub that grows in damp woodlands and open forests in the hills near the east coast (especially in and around the Douglas Apsley National Park. It has opposite and decussate leaves that are entire, and a few cm long. 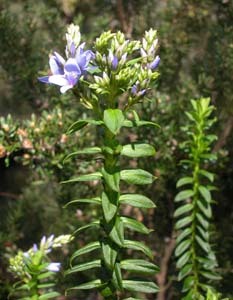 The flowers are almost radially symmetrical (with the upper petal slightly larger) blue-purple and in dense, spike-like inflorescences clustered at the ends of the branches. Veronica continua used to be considered as part of V. formosa, but is clearly different in being mostly unbranched, and having larger leaves and inflorescences clustered at the ends of the branches.